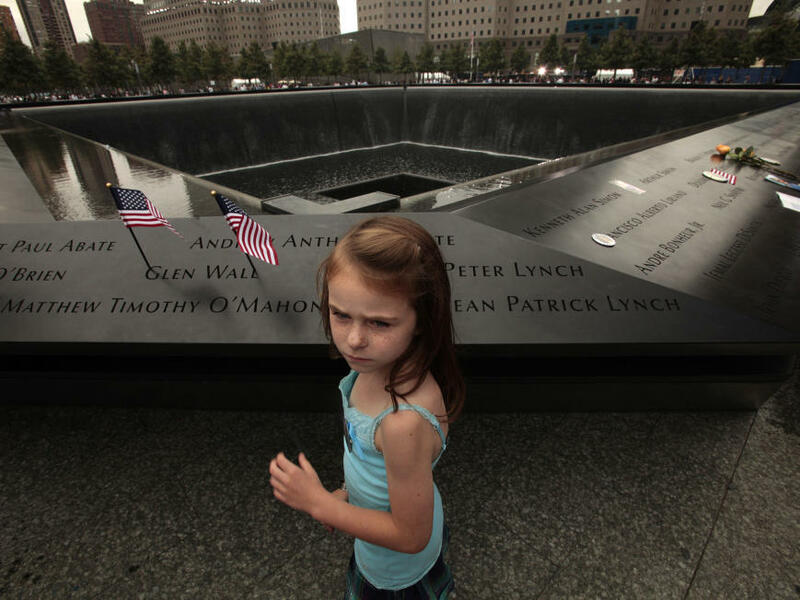 Keri McMorrow, 7, visits the memorial pool where her uncle's name is engraved, during tenth anniversary ceremonies of the September 11, 2001 terrorist attacks at the World Trade Center site. It seems there are two types of stories about how children who experienced Sept. 11: First, of course, there are the stories about the children who lost parents on that day, and then there are those who are too young to remember what life was like before the attacks. Kate Bralauer is 11. She's from Manhattan, she's never seen the skyline with the towers in it. But 9/11 matters to her. "I think grownups think it wasn't like as bad, but that was the day a lot of children realized parents and like grownups are vulnerable," she said. Samantha Philips is 15, and from the suburbs. She had the same feeling. "My school had to sit down and break it to all these kids that there's bad in the world. There are bad people in the world. Bad things happen," said Philips. Tiffany-Amber DiGrazia is ten. She's from Queens. "I don't really think adults are telling kids enough. I just started school a few days ago, and this is the year they're finally going to tell us about 9/11," said DiGrazia. Tiffany-Amber is already well-versed in the subject. Her mom is a New York City firefighter. During our live coverage, we heard from 20-year-old Laila Alawa, who was at home with her family in upstate New York when the planes hit the towers. Alawa, born in Denmark, was 10-years-old at the time, and she said that "didn't understand" what was going on. "I couldn't comprehend why someone would actually do that," she said. But she said she remembers it was the first time she felt American. Then she learned Osama bin Laden was Muslim. "When they said he was Muslim, I went into shock, because I didn't know how to put the two together," she said. "How someone who said they were Muslim was trying to harm Americans." Our friend Tom Huizenga over at Deceptive Cadence also touched on this subject this week. He spoke to composer Michael Gordon, who based one of his pieces on the conversations 3- and 4-year-olds were having about Sept. 11.